Has anyone not been bitten? This vampire trend seems to be sucking in everyone. From the Twilight saga to televised shows like True Blood and Vampire Diaries, it seems there is no escape from this infecting movement. Heather Brewer, author of The Chronicles of Vladimir Tod book series, continues to turn regular folk into minions with her stories, presence and outlook. The 36-year-old writer appeared at the Magic Tree Bookstore in Oak Park on Feb. 18 to shed light on her life and creative work. Though Brewer now lives in St Louis, Mo. with her family, she was raised in a small Michigan town with a population of 814. She was the unpopular kid growing up. Looking like a vampire herself, Heather Brewer is the author of the popular book series, "The Chronicles of Vladimir Tod." Photo by Mimi Ragano. “Even the adults didn’t like me,” she said. Being bullied made her who she is, one tough chick. 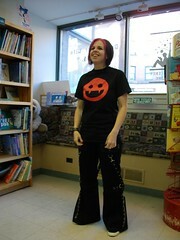 Brewer stood before her audience, towering not much over five feet, dressed in Hot Topic black pants with silver chains and grommets. Brewer’s popularity is growing, making the USA Today’s Best Seller List at number 69 and The New York Times Best Selling Series List at number 6. At 12 years old, Brewer decided she wanted to be an author, but parents and other adults around her were discouraging. They told her to focus on getting a real job. “I didn’t know what a real job was, but I knew I wanted nothing to do with it,” Brewer said. It was these three words that changed her life, and Brewer decided to follow her writing dreams. This was when she started considering the possibility of getting published. Brewer sent out her work, and was rejected 248 times. The second time she was rejected 98 times before halting her submissions. This called for a reevaluation. She considered the popular phrase, “To write well, write what you know.” So she made a list of things she knew, which consisted of three things: what it is like to be unpopular, teenagers and vampires. Each vampire smiley comes in a different color, representing a different book in the series. "Eighth Grade Bites" started with the red, "Ninth Grade Slays" is blue, "Tenth Grade Bleeds" is purple, "Eleventh Grade Burns" is orange and "Twelfth Grade Kills" is green. Photo by Mimi Ragano. Her fascination with vampires stemmed from Count Chocula breakfast cereal, Sesame Street’s character The Count and, of course, the infamous Dracula himself. Brewer felt that her writing “was right this time.” It only took her four months to write the entire first book. And she had seven offers by publishers for representation within the first week of sending submissions for publication. “Follow your dreams no matter what you do, and be sensible about it,” Brewer said. Recently, Brewer returned to her middle school to give a talk. There, she was able to get vengeance on her former unpopularity because many of the kids she went to school with stuck around the town and had children of their own. It is those kids that are now reading and worshiping Brewer’s books, the sons and daughters of those who used to bully her. 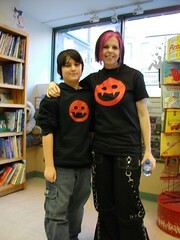 Heather Brewer and fan Andre Marin (my brother) both sport Vlad gear. 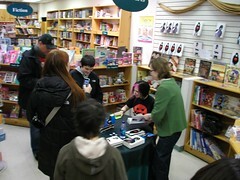 Fan wear is not yet available on Brewer's site, but the author holds online contests in which readers can win t-shirts and hoodies with the vampire smiley. Photo by Mimi Ragano. Many of Brewer’s minions are curious as to how Brewer feels about the Twilight series. She said she liked the first book, but Brewer read the second and third books for the characters other than Bella because she “prefers strong female characters.” Brewer was dissatisfied with the last Twilight book, however. Brewer is a strong advocate for reading and said she “love[s] books because there are so many different kinds.” For readers who can’t find a good book, she suggested going to bookstores and libraries to talk to the workers about what kinds of books they might enjoy. Vladimir Tod begins the series in eighth grade and ends in his senior year of high school. After Eighth Grade Bites come the books Ninth Grade Slays, Tenth Grade Bleeds, Eleventh Grade Burns, and finally Twelfth Grade Kills. Twelfth Grade Kills is the only book that is not out yet, but its release date is Sept. 21, the same day the author turns 37. 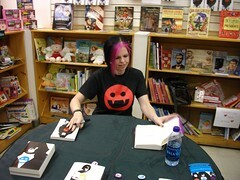 For additional information, please visit the Heather Brewer site. Golly, i love ur bros hoodie, i want one so bad!!! Caant wait for Twelth Grade Kills.